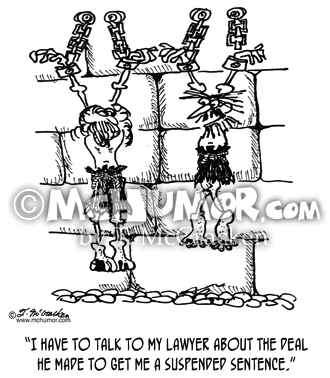 Prison Cartoon 2643: A man hanging in a dungeon says to another, "I have to talk to my lawyer about the deal he made to get me a suspended sentence." 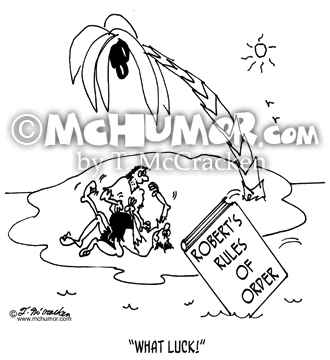 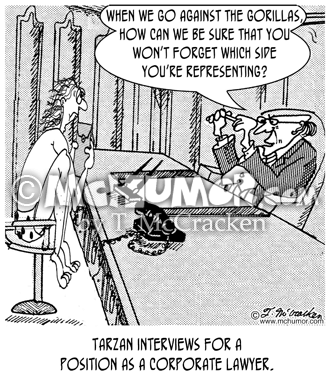 Law Cartoon 7310: “Tarzan interviews for a position as a corporate lawyer.” An interviewer asks, “When we go against the gorillas, how can we be sure that you won’t forget which side you’re representing?" 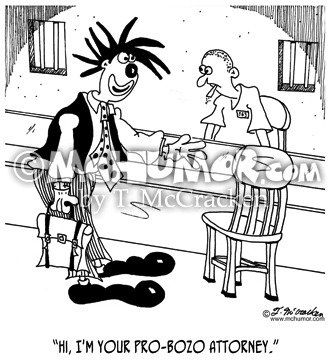 Lawyer Cartoon 6510: A defense attorney dressed as a clown greeting his client, "Hi, I'm your pro-Bozo attorney." 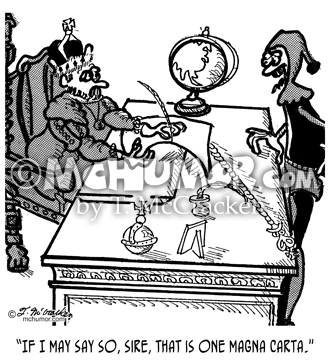 Magna Carta Cartoon 2639: A court jester says to a king, "If I may say so, sire, that is ONE Magna Carta." 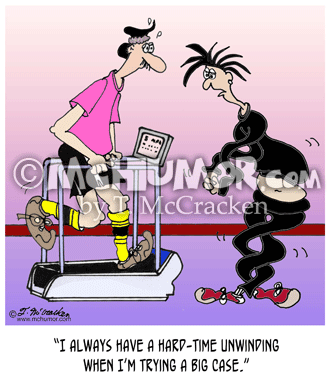 Lawyer Cartoon 8300: A woman in a gym with a twisted body saying, "I always have a hard-time unwinding when I'm trying a big case." 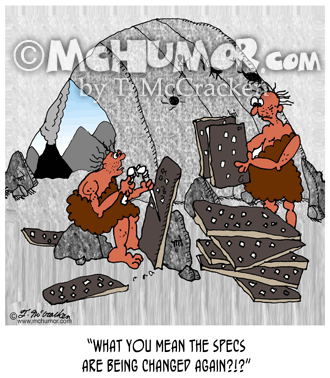 Engineering Cartoon 7527: A caveman surrounded by stone tablets and chiseling on one and says, "What you mean the specs are being changed again?!?" 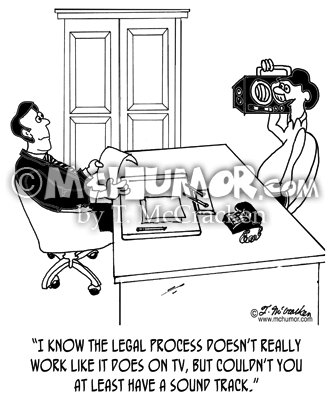 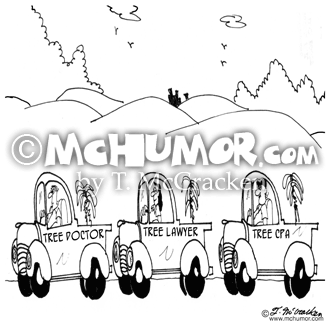 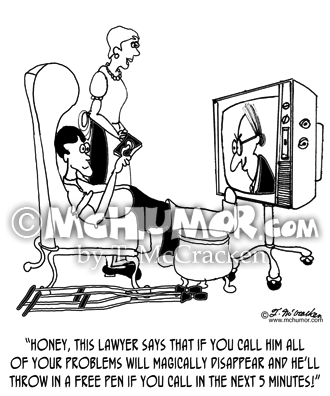 Music Cartoon 8362: A client says to a lawyer, "I know the legal process doesn't really work like it does on TV, but couldn't you at least have a sound track." 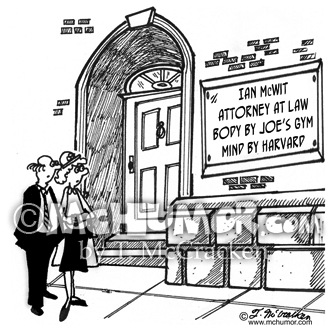 Exercise Cartoon 2676: A plaque outside an office says, "Ian McWit, Attorney at Law, Body by Joe's Gym, Mind by Harvard."